Addy Dugdale: Hi John. We've seen the pictures of your simulator, but can you tell us a bit more about the gear you use, please? John Davis: Well, the software I use is a Microsoft Flight Simulator for the visuals, as well as the Aerowinx PS1, which has about 30 different programs. AD: And what about the hardware? JD: The main screen measures 12 ft x 9 ft, and I made it myself, and there is a 19-inch flat screen on each side. Other stuff (like the autopilot system, throttles and weather radar) was sourced from the internet. The cockpit I made myself from wood. 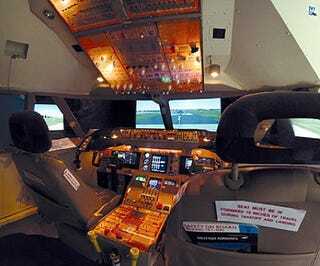 AD: How's the flight simulation business going? JD: I've been running it since June, but it's a bit quiet at the moment—although hopefully that will change, as I've done four radio interviews today as well as speaking to the newspapers. 420 ($850) for six hours. AD: And finally, what else do you keep in your spare bedroom? JD: "There's no room for anything else—that's why my wife had to go!" AD: Thanks John—and good luck! Although he holds a glider pilot's license, John, who has clocked up around 2,500 hours on the simulator, claims he wasn't good enough at math to fly proper planes. "This is the next best thing," he says of the 747-400 he has assembled in his spare bedroom, which has a pair of car seats for the captain and first officer to park their butts on.